16 October, World Food Day, is a time for people and organizations to come together to find ways to alleviate world hunger. I am fortunate to be involved with two wonderful organizations—Rotary International and The Global FoodBanking Network (GFN)—that understand the value of collaboration and are fully committed to making the world a better place. As service partners, Rotary and GFN work together around the world to support local food banks. A food bank is a sustainable community asset that addresses two of the world’s most pressing problems: hunger and food waste. Even though enough food is produced to feed the entire globe, there are approximately 800 million hungry people in the world. One third of the world’s food that is produced for humans is lost or wasted. Much of this food winds up in landfills, never reaching a hungry person. Food banks rescue perfectly edible, safe and nutritious food and redistribute it to hungry people through a variety of social service organizations such as shelters, orphanages, soup kitchens and after school programs, to name a few. GFN is the founder and leader of a thriving network of food banks around the world. We help create food banks in communities where they do not exist and we support and strengthen food banks already in operations. As a member of GFN’s Network Development Team, I have the privilege of working directly with food bankers around the world to help them fight hunger every single day. We provide these social entrepreneurs with education, training, in-field assistance – everything needed to help them find the most efficient ways to get more food to more hungry people. 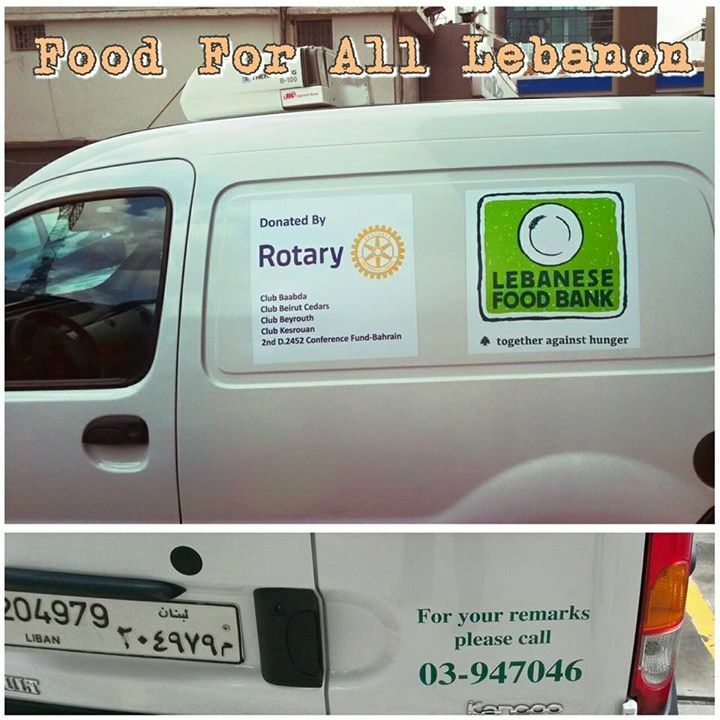 Lebanon: Four local Rotary clubs pooled their collective energies and resources and helped the Lebanese Food Bank secure a new vehicle that enables the food bank to continue distributing food to its partner agencies throughout the region. And as all Rotarians know: together we can do more! Hong Kong: Working with Feeding Hong Kong, Rotaractors from The Chinese University of Hong Kong helped assemble 192 family packs of nutritious food products for people in need. India: The Rotary Club of Kolkata Mahanagar partners with the India Food Banking Network (IFBN) to collect food products that would otherwise be wasted. IFBN trained the club on how to conduct food drives and other operational aspects of running a food bank. On World Food Day 2015, we at GFN and I as a fellow Rotarian, encourage all of you to Be a gift to the world by supporting food banking. Your support can be of time, talents or treasure. Food banks in the GFN family can use your help in their daily fight to eliminate hunger and curb food waste; visit www.foodbanking.org for more information and tools to get involved. In honor of World Food Day, share pictures of how your club and district is addressing hunger in your communities on Instagram and Twitter accompanied by the hashtag #RotaryStopHunger. You can also Join Rotary First Harvest (@RFHarvest) and the Rotarian Action Group for the Alleviation of Hunger and Malnutrition in a Twitter chat by signing on to Twitter from 12:00 PM to 1:00 PM Chicago time (UTC-5) and adding your voice to the #RotaryStopHunger conversation. President Rotary Club JAIPUR Central we wish to join in this noble drive guide us . Thank you for your interest in starting a food bank in Jaipur. The Global FoodBanking Network’s Knowledge Center provides a number of excellent resources to help you get started: https://www.foodbanking.org/food-bank-resources/knowledge-center. You can also contact Craig Nemitz directly to discuss opportunities to help reduce food waste: rotary@foodbanking.org. Glad to be involved in this project within my Home club of Kesrouan in Lebanon. Thank you for other RCs partners and DG 2014-2015 Khalil Al Sharif.